Despite high cholesterol levels, Los Pacaminos deliver excellent results. 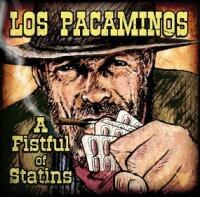 A Fistful of Statins is the second studio album from Los Pacaminos, a UK band that has been together since November, 1992. Los Pacaminos are kind of a quirky supergroup, with well-known soul singer Paul Young heading up a crew of seasoned professional musicians. Young shares vocals with Drew Barfield, pedal steel guitar is provided by Melvin Duffy, keyboards by Matt Irving, and guitar by Jamie Moses. You may not immediately know these names, but between them they’ve written for and played with a host of music luminaries including Joe Jackson, Robbie Williams, Squeeze, Sir Tom Jones, and Chris Rea. The band started out as an antidote to a bleak English winter, playing just for sheer pleasure, but word got out that this was not a group to keep hidden in the garage, and Los Pacaminos sprung out into public view through live performance. It took them 10 years to put out their self-titled debut, and another 12 years for the follow-up. These boys may not work fast, but it must mean there's some staying power. There's also an undoubted sense of humor underlying much of what they do. This is no comedy act however, and A Fistful of Statins boasts an astounding mix of musical styles, with the common element being twangy Americana. “Razor Wire” sets the scene as an instrumental guitar piece, more Serge Leone than Calexico due to the nature of the attack. Because it’s such a gritty and determined start, the romantic harmonies which follow in “Jump Back Baby” come as a pleasant surprise -- there’s a certain amount of eccentricity and lightness of touch which is reminiscent of the Travelling Wilburys. The band in fact displays its influences proudly, so much so that “The Girl From Tennessee” could be a Joe Ely outtake and the tender “Caballero” a Roy Orbison song. For some this could suggest a lack of originality, but the record is so well executed that it’s hard to fault what may be a tribute to the originals. So what about authenticity? Should British men play tex-mex music, when Mariachi and Norteno are part of an ongoing Mexican musical tradition not intended for gringos? On the basis of A Fistful of Statins, the answer is a resounding yes. Music is not a pure breed dog, and it’s all the more richer for musicians of different cultures adapting and experimenting with what appeals to them, and what they play well, irrelevant of where the music originates. “Don't Make Me Wait Senorita”, “Mi Chirozo”, and “Come a Little Bit Closer” are cases in point -- there’s a real sense of exuberance and enjoyment. This is a band as a true collective, with what seems like swapping around of instruments and trading of verses. The band is equally adept at coping when things get sad and lonesome, from the weary alcoholic strains of “Battered & Broozed” to the break-up ballad “A Letter to You”, the latter charmingly sung by Paul Young, with beautiful played pedal steel guitar. You could also say that the diverse musical nature of the album may distract the listener who is seeking absolute artistic cohesion. Such an argument would be missing the spirit of what is ultimately a fun and upbeat record. Southern American country is well represented by “A Little Love”, “Every Little Hero”, and rock by “Our Favorite Things”. “Texas Adios” has some superb slide guitar, and there’s even some 1950s crooning in “Made for Me”. To write this band off as a novelty would be a mistake as Los Pacaminos have a playful, creative outlook, and as such A Fistful of Statins is a guaranteed blast of sunshine, despite the uncertain British weather.